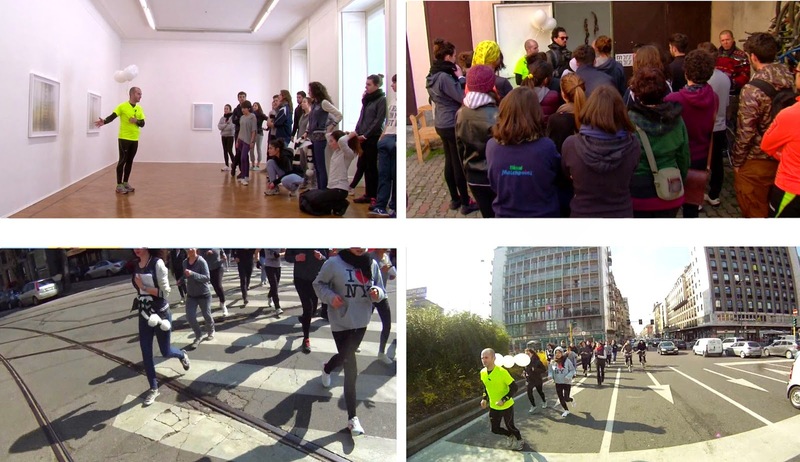 The Art Pacemaker is a “race of art”, a collective performance, a running guided tour through galleries, foundations, non-profit spaces and museums of a city. During a marathon, the “pacemaker” is a runner in charge to run at a steady pace in order to stop in the time indicated by the numbers written on the balloons that they have fasten to their vest. The pacemaker acts as a motivator as well as a leader. When runners stop at any gallery or museum, the artists-pacemaker focus on a single work, they introduces “pacemaker work” for runners. The recurring rapid transfers and the several stops at each single art work aim to let runners achieving the feeling they have visited a museum expanded, abolishing the fragmentary nature of the complete route and the individual locations. 2013, Video Performance, 8’30”, color, sound.